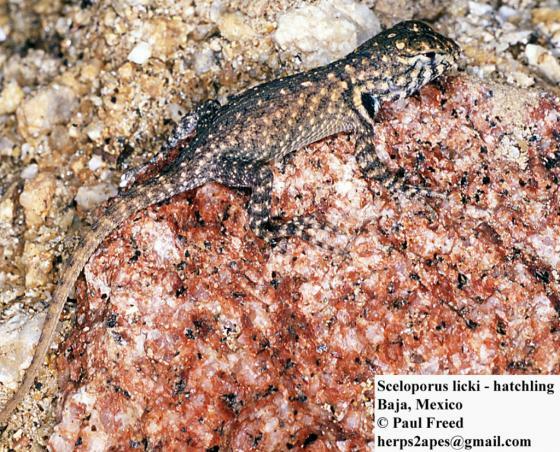 Can you confirm these amateur observations of Sceloporus licki? Type locality: Sierra San Lázaro, Baja California. Types Holotype: CAS 1436 (thought to be destroyed in 1906 fide SMITH & TAYLOR 1950 who designated CAS 2987a, formerly at Stanford Univ. Mus., as lectotype), still extant in CAS. Etymology The name honors James Lick, a philanthropist who left his home in Pennsylvania, with little money, became a master cabinetmaker, then went to South America and returned to San Francisco in 1848 with more than $30,000 in gold. He invested in prime waterfront properties and allegedly became the richest man in California. He is buried on Mount Hamilton, beneath one of the piers of Lick Observatory.